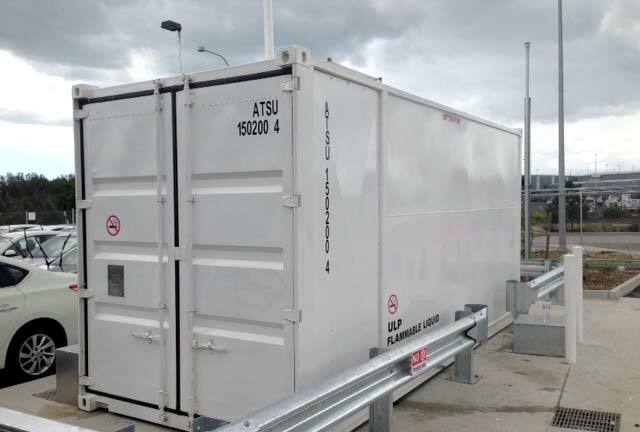 The standard 20ft Steel Self-Bunded Container Tank from Tank Solutions offers all the features you need in a portable diesel fuel container tank with the added benefit of being supplied by an Australian based ISO9001 compliant company. This provides control over the total manufacturing process ensures an attention to build quality and compliance to AS1940 and AS1692 that is sometimes missing in imported container tanks. You can be assured that the welding quality and standard of painting for this tank is in conformance with Australian Standards. The dispensing equipment can be customised for different pump configurations, dispensing rates, fuel management and monitoring systems. This equipment can be fitted by your choice of an accredited installer or contractor on or offsite. © 2016 Tank Solutions Pty Ltd.